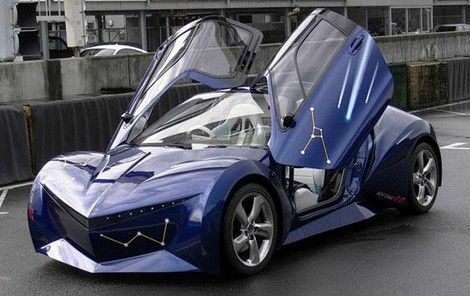 At a small auto show venue in Japan, the Toyota Engineering Society unveiled a new crowd-sourced concept electric car called the TES-ERA Sports EV Concept based on its popular 1990s Sera two-door coupe. The TES-ERA is a concept through and through. The Toyota Engineering Society (TES) had three requirements for the concept's design: a 2-door gull-wing coupe based on the Sera (a coupe produced in the 1990s for the Japanese market), a race or sports focus with futuristic technology, and the car must be an electric using the Toyota Group's existing drive train platforms. The requirements were then given to the engineering team who went to several sources to get design elements. A Japanese grade school provided the color scheme and Milky Way paint theme sported on the exterior of the TES-ERA EV. The Lexus brand provided the base technology to power the electric car through Lexus RX hybrid system components. Engineering students and interns created the body concept while Toyota's electronics design team provided the internal touch screen interfaces. The interior itself is simple and white, focusing entirely on those screens. Much of the car is very flexible in design, allowing personalized changes to the interface inside (via the touch screen software), etc. The car is powered by a 15.7 kilowatt hour (kWh) lithium-ion battery pack that gives the concept a range of 80km (50 miles) in urban driving. When racing on the test track, the car got about 50km of range (31 miles) under those hard driving conditions. The two motors have a total output of 128 kilowatts (kW) or about 174 horsepower. Can I use this image in a wiki article?